Examining the crucial interrelationship between nursing research and health policy, this book presents examples of specific health care policy that has been influenced, implemented, or changed as a result of nursing research. It builds on the discussion of this relationship as described in the editors' earlier book, Shaping Health Policy through Nursing Research, named a Doody's Core Title in 2013 and an AJN Book of the Year in 2011. This current edition updates earlier information with new nursing research by esteemed scholars. It encompasses research related to major policy statements of the decade, including the IOM Future of Nursing report, the Affordable Care Act, and the Blueprint for Genomics in Nursing, and highlights how they have influenced, and will continue to influence, health policy. 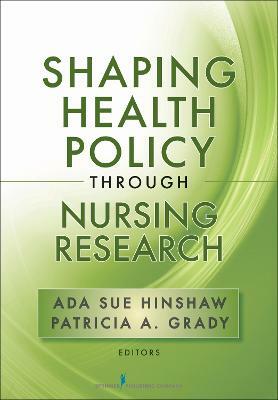 Written for multiple audiences including undergraduate and graduate students, faculty, and nursing professionals, the book presents information on how science shapes health policy in general, models and strategies for linking research and health policy, and multiple examples of how major nursing research has influenced health policy. The text provides both a conceptual orientation and an operational approach to strategies linking research to policy and influencing policy makers at the organizational, community, state, national, and international levels. First place winner in the 2017 American Journal of Nursing awards. Buy Using Nursing Research to Shape Health Policy by Patricia A. Grady from Australia's Online Independent Bookstore, Boomerang Books. Patricia A. Grady, PhD, RN, FAAN has been associated with the National Institutes of Health, since 1988, first as an extramural research program administrator in the National Neurological Disorders and Stoke (NINDS) in the areas of stroke and brain imaging, as a member of the NIH Task Force for Medical Rehabilitation Research, and Assistant Director of NINDS, until 1995, when she was appointed as Director of the National Institute of Nursing Research (NINR). Under her leadership, the Institute has more than doubled its budget and significantly increased the number of research and training grants awarded. Dr. Grady also is an internationally recognized researcher, whose focus has been on the topic of stroke. Previous to her work at NIH, she served as faculty at University of Maryland School of Nursing and School of Medicine. She has co-authored numerous articles and serves on many editorial journal boards, including Stoke, Stroke and Cerebral Vascular Diseases, and NeuroTherapeutics, the Journal of the American Society for Experimental Neuro Therapeutics. Dr. Grady has been the recipient of number prestigious awards, and is a member of the American Academy of Nursing. Her most recent notable awards have included the Second Century Award for Excellence in Health Care from Columbia University School of Nursing, and the Honorary Doctor of Science degree from Thomas Jefferson University and the Medical University of South Carolina.Ada Sue Hinshaw, PhD, RN, FAAN is Dean and Professor of the Graduate School of Nursing at the Uniformed Services University of the Health Sciences and Emeritus Dean and Professor at the University of Michigan School of Nursing where she served as Dean from 1994-2006. Dr. Hinshaw was selected as an American Academy of Nursing/ American Foundation of Nursing/ Institute of Medicine Senior Nurse Scholar from 2006-2007. Prior to her appointment as Dean at U of M, Dr. Hinshaw served as the first permanent Director of the National Center of Nursing Research and the first Director of the National Institute of Nursing Research at the National Institutes of Health. During her tenure at NIH, Dr. Hinshaw was responsible for promoting research in the areas of disease prevention, health promotion, acute and chronic illness, and investigating environments that enhance nursing care patient outcomes. Other positions at academic institutions include Univ of Arizona College of Nursing, UCSF College of Nursing and Univ of Kansas College of Nursing. She has conducted research in quality of care, patient outcomes, measurement of outcomes, building positive work environments to enhance patient safety. She is the recipient of many awards for her work, including MNRS Lifetime Achievement Award, Health Leader of the Year award from the US Public Health Service, Award for Excellence in Nursing Research (STT); Nurse Scientist of the Year award (ANA Council of Nurse Researchers) and the Walsh McDermott Award from the IOM. She has received 13 honorary doctorates.